We as a LikeFinland team visited Restaurant Kuninkaan Lohet by the river of Vantaa near Helsinki Airport this spring 2018! There are two historical buildings that are used for providing lunch at restaurant and party services as well as space for corporate occasions such as meetings and team building days in this gorgeous area. Also foreign tourists are welcome to explore Finnish specialities such as nature experiences, authentic Finnish food, and sauna! In May 2018 it was once again a busy day at the old factory building called Vanha Viilatehdas (Old File Factory) and at the old yellow wooden manor called Kuninkaan Kartano (King’s Manor). That day there were held many business meetings and the lunch was enjoyed by a lot of Finnish people and also by international guests. We explored the surroundings and got to know the area! The birds were singing and the springlike nature was at its finest as we walked along the clear forest path that left us amazed by the beauty of the Finnish nature. Mika Turunen, who started as a CEO of Kuninkaan Lohet a year ago in 2017, spoke highly of the area. 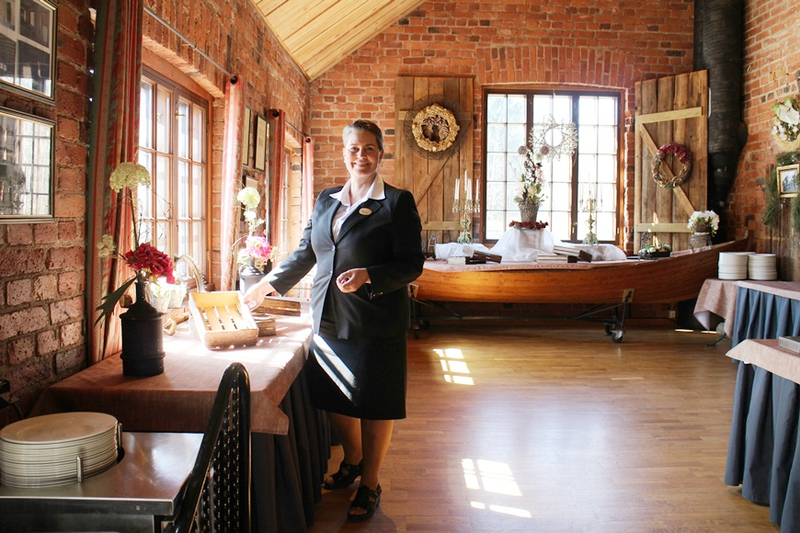 Mika said that this Kuninkaan Lohet destination combines all the different features of the Finnish nature and countryside – the fields, country roads, shores, cliffs, and the list goes on. A fun fact is that in the Stone Age the waterline of the sea was in this area but as of now the landscape is amazingly diverse! From the river you are able to even catch salmon by fishing. The path through the forest was perfect in length because it took us only about 20–30 minutes to get back to Old File Factory. But if you really want to, you can follow the country roads all the way to the central park of Helsinki city – by hiking or by mountain bike for example! The starting point of the popularity of the area goes a long way back to the Middle Age. The manufacturing was active back then because of the possibilities the rapid water was able to offer. – Because of the manufacturing, this area was the entertainment center back in the day, Mika Turunen said. Mika Turunen tells us that the factory building was left without any use after the 1950s, and because of that, it was turning into a ruin. Only 18 years ago the potential of the building and of the whole area was noticed again. Kuninkaan Lohet team decided to renovate the Old File Factory by replacing most of its walls and other features. Not all of the walls were torn down but left in place to function as decorative features. Now the white Old File Factory as well as the wooden building King’s Manor are great places to hold business meetings, corporate events or even to throw different kinds of parties from weddings and graduation parties to birthdays and bachelor parties – or feel the Finnish peace and happiness for the foreigners. 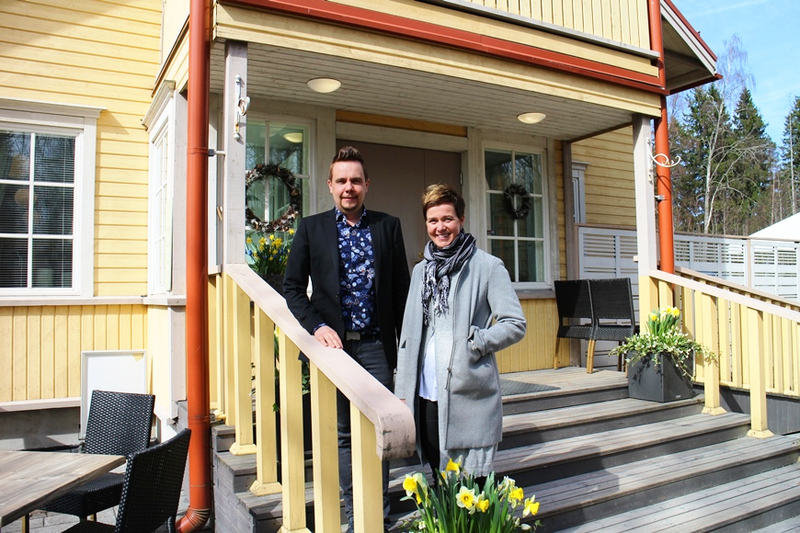 – The terrace is for certain the most gorgeous one in Vantaa, Sales Manager Mervi Repo said about Old File Factory’s terrace next to the rapid water. And for sure it is! The File Factory summer lunch is served Monday to Friday between June 4th – August 10th 2018. The yellow wooden manor is a little bit younger in age than the old file factory building. Originally King's Manor was a school from the early 1900s to 1970s. From the year 2006 the building has been used as a restaurant. There is also a sauna area in the second floor both in the King's Manor and the Old File Factory! After the tour we enjoyed lunch at King's Manor. During the summer months the lunch is served in Old File Factory. You can enjoy the river view from the terrace at lunchtime! For 15 € anyone can enjoy a full lunch which includes a salad buffet, the soup of the day, a main course buffet, a dessert, and a selection of breads. Take your staff or your clients to enjoy the outdoor activities! Groups of at least 5–6 people can participate activities such as canoeing, fishing, arts and crafts, and cooking courses. The newest activity in the summer of 2018 is SUP Boarding in the River Vantaa! SUP boarding is suitable for everybody, and Kuninkaan Lohet offers you an instructor along with a board and a paddle. – The SUP boarding experience is one of a kind in Southern Finland, Mika Turunen says. Read more about all the activities here. Helsinki Airport is closer than you might think! The Jumbo Shopping Center is only 10 minutes away and there are plenty of accommodations nearby. To sum up, Restaurant Kuninkaan Lohet and the surrounding area is the place to visit if you want to experience the diversity of the Finnish nature all at once in 20–30 minutes, eat great food, take part in the activities, and do all this in good company that may consist of your friends, colleagues, or business partners near Helsinki Airport and Helsinki city center! One of our Star Destinations, Restaurant Kuninkaan Lohet, is located in Vantaa by the River Vantaa about 15 minutes from Helsinki Airport and 40 minutes from Helsinki city center. Restaurant Kuninkaan Lohet offers services for arranging different kinds of events for groups of 2–500 people, provides different kinds of activities for groups, and serves lunch from Monday to Friday most of the year in Kuninkaan Kartano (King’s Manor) and during the summer months in Vanha Viilatehdas (Old File Factory). For contacting and for more information visit Kuninkaan Lohet's website here. Restaurant Kuninkaan Lohet is one of our Star Destinations and media customers.